The day’s activity is pretty light with a 3.15 mile (5 km) and is built into the itinerary to help with proper acclimatization. And it is also a less strenuous day to help us rest up for the next two big days ahead. 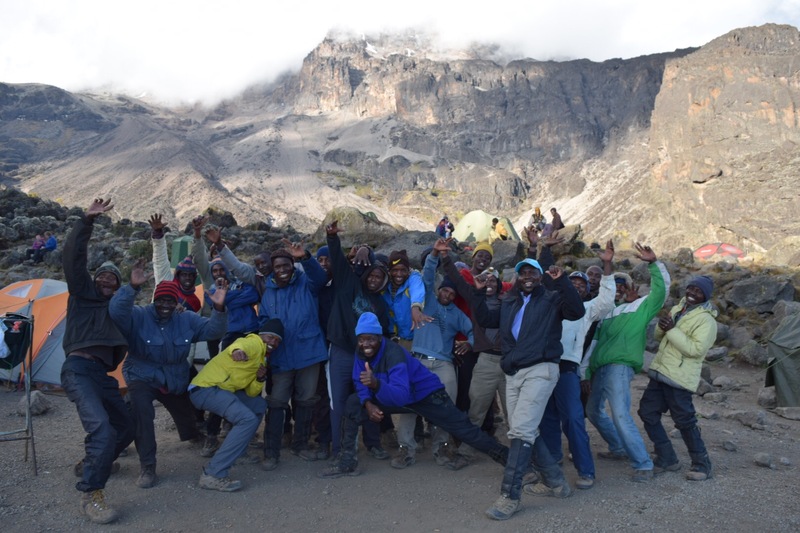 We head up the Barranco Wall where this is quite a bit of scrambling and watch in awe as porters with their heavy loads fly by. There are even spots where we have to hold on with both hands on a narrow ledge and this is the same route that the porters use! 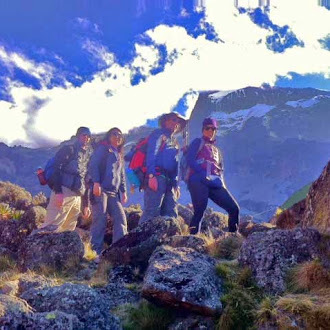 We reach Karanga Valley camp elevation 13,277 ft (4046 m) in the early afternoon. We are getting closer and closer to the summit!! We were even lucky enough to see Moshi at night when the clouds lifted – too bad I had broken my camera tripod early in the trek and was unable to take a good night picture. 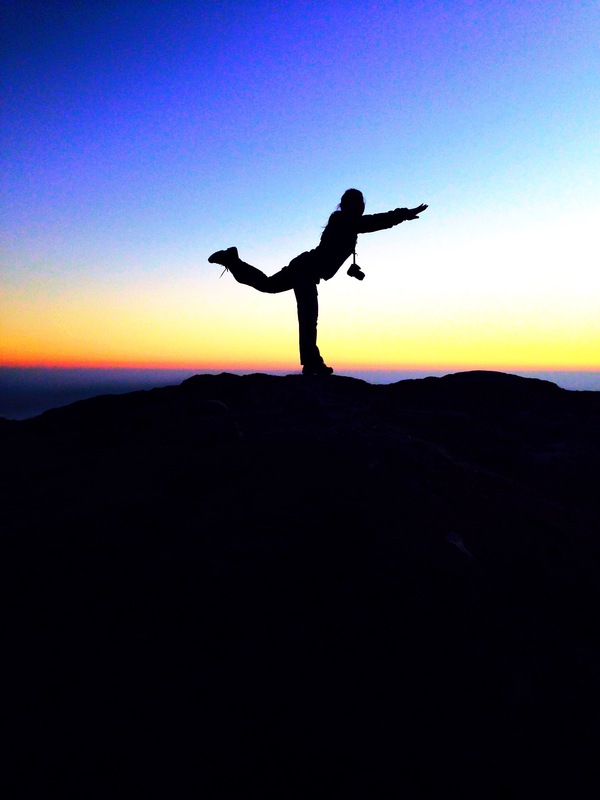 That was my big disappointment of the trip – no good Milky way, star, or night pictures on Kili. However, did manage to have this picture shot – I will admit that I was originally trying to get into Warrior III but that proved difficult with a camera dangling from my neck and perched on a rock in heavy hiking boots….and while trying to give directions on how to get a silhouette capture. It was rather indulgent to have a crew of 25+ (yeah still not sure exactly how many we had!) 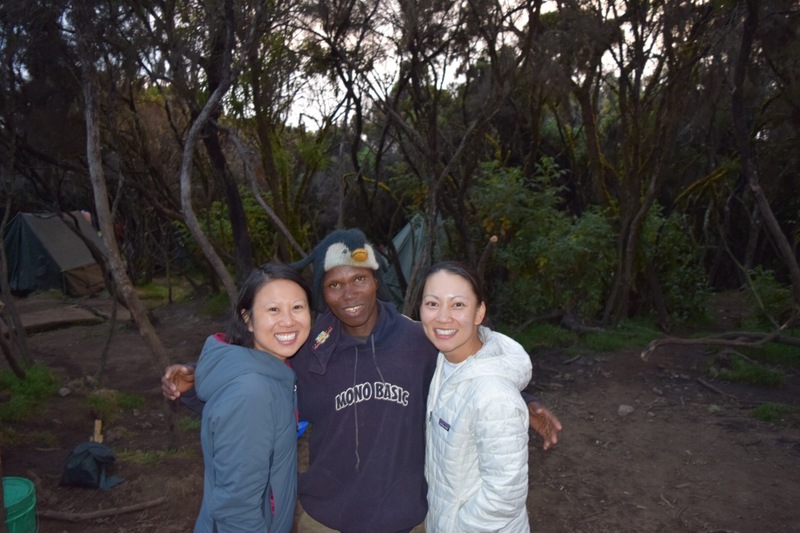 for our small group of four and the whole Taraji Kilimanjaro team was amazing. We had talked them into doing a song and dance routine that is typically done at the celebration ceremony at the end of the climb and this is the posing that spontaneously occurred at the end. What I did not expect from the trip was the amazing connection that we would make with our team. They taught us Swahili and we taught them new English phrases and words – such as meh – yes, I know I am such a great cultural ambassador! It’s the amazing part of traveling when you visit a country and are able to learn so much about people and their culture. Though sadly, it seems that most hikers on the trail did not engage much with their guides and definitely not at all with the porters. We would greet everyone in Swahili and most of the other teams were rather surprised by this as well as their clients. 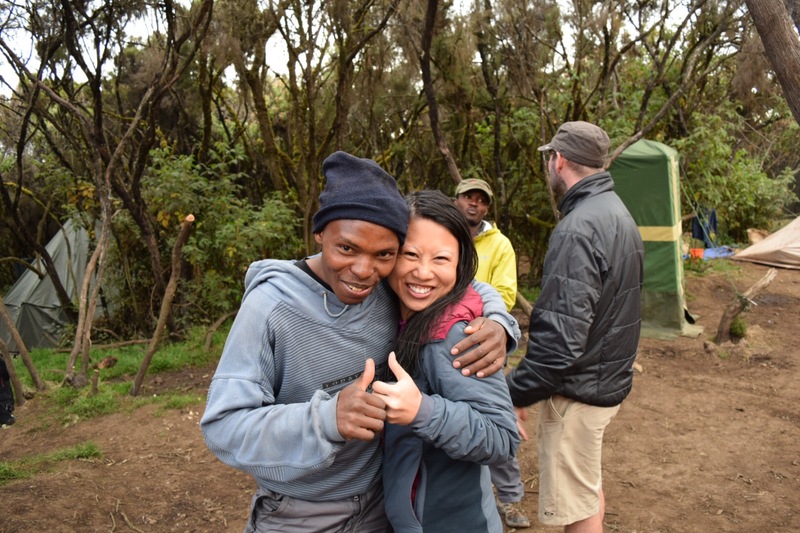 A funny interaction I had with one man was when he asked if we had learned Swahili prior to coming and I told him a few phrases but most of what we learned was on the climb. He seemed confused about how that was possible and I had to stifle a laugh thinking to myself what else are you doing with your 4-6 hour hikes? And all the downtime that you have between finishing the day’s hike and dinner? Sure your guide may not take the complete Swahili immersion route that Robert decided to take with me but I am sure that he would be more than happy to teach you a few phrases…but to each their own. And also I must admit that I am a very outgoing person and people tend to be more outgoing around me. I do think that travel should be more than just checking something off a list and being able to say you were there – it should be about embracing what is around you and really diving into the experience.